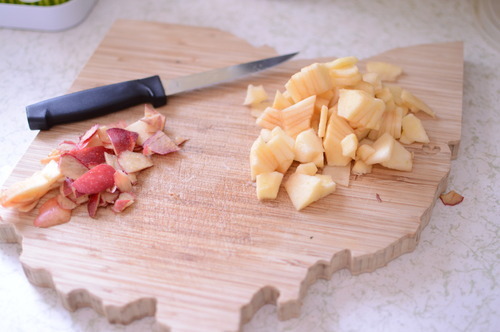 As you know, we have some great apple orchards here in Ohio, home of the Buckeye Gala apples, exclusive to the Ohio Valley. Since I only have so much peanut butter to go with these apples as a snack, I decided to try a more refined recipe involving apples. 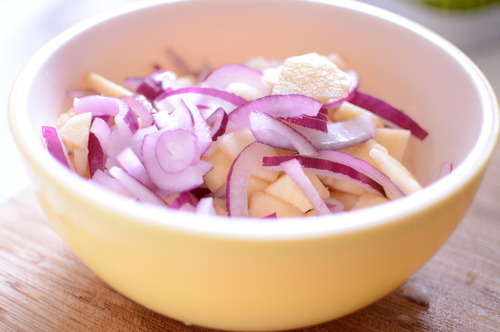 I found this awesome recipe from Nom Nom Paleo, and since I’m trying to revive my former gluten free diet, it fit perfectly into my meal planning. I made a few changes to suit the ingredients I had on hand. Not only did I think they came out delicious, but the Husband also approved! 2. Remove bacon to a paper towel. 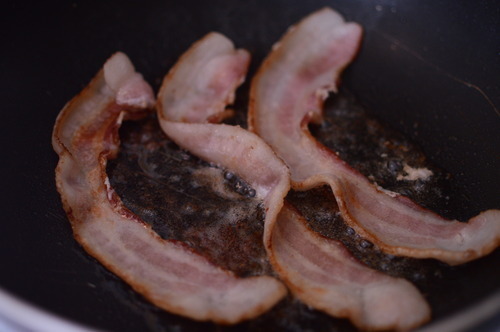 There should be bacon drippings leftover… add your 2 TBS of arrowroot powder to the grease and whisk over low heat, forming a roux, until your mixture is a golden brown. Pour 1.5 cups of chicken broth into the skillet, and whisk until its fully incorporated. Then pour your roux into a small sauce pan and set aside, leaving the skillet empty [with just a little of the grease remaining]. 3. place apple and onions into the skillet with the remaining bacon grease. Cook roughly for 5 minutes, stirring occasionally. Be sure to scrape up all the tiny bacon bits that may be stuck to the pan from earlier! 5. 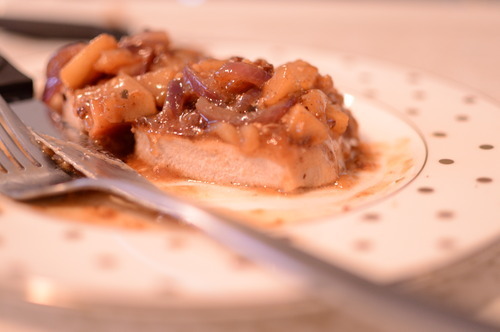 Add your pork chops to your apple and onion mixture. also add the garlic at this time. cook pork for 1 min on each side. 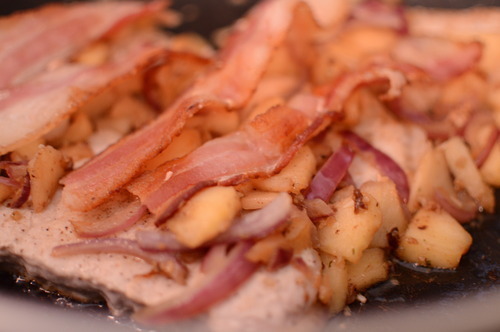 6. after the 2 min total cooking time, smother your pork with the apple, bacon, and onion mixture… Also add the roux to back into the skillet and simmer, on low heat, for15 minutes. 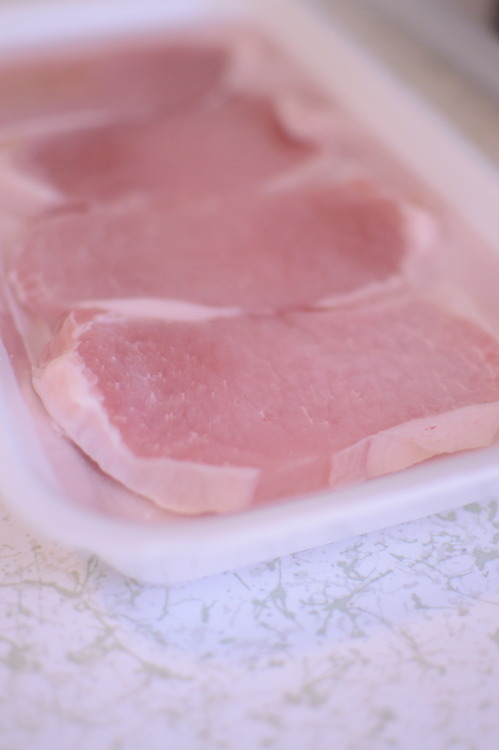 When your 15 mins is up, you should have nice tender pork, ready to be eaten! Sever with your favorite side, such as, mashed potatoes or a cauliflower puree! Enjoy!